Doing consults for people, there is one important fact about humanity that I have discovered. People love ice cream. 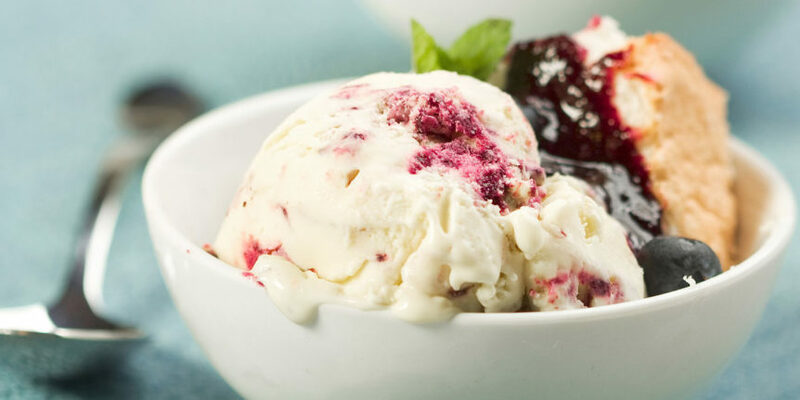 Let’s take a look at how ice cream fits into ayurveda. Are you feeling hopeful? Stay with me until the end! The heart of ayurveda is about balancing qualites. There are ten pairs of opposites (for twenty total qualities) that are measured in our bodies, our environments, our universe. Everything we can perceive has qualities. These qualities come from mixes of the five great elements (earth, water, fire, air, space) in which all things are created. Some of the important qualities we must consider when choosing foods are hot/cold, heavy/light and oily/dry. If we have an imbalance with one of these qualities, we will treat the imbalance with its opposite quality. i.e. If we are too dry, we will eat oily foods until the imbalance is corrected. Most people, when first discovering ayurveda, learn about the doshas, or the functional energies…vata, pitta and kapha. These are described in groups of these qualities. Vatas (air and space elements) tend to be cold, light and dry. Pittas (fire and a bit of water) tend to be hot, light and oily. Kaphas (earth and water) tend to be cold, heavy and oily. Ice cream is sweet (earth and water) and is cold, heavy and oily. It is all of the qualities that make up kapha…and ama. First let’s talk about what is agni. Agni is our digestive fire. It literally cooks the foods that we eat and transforms them into nutrients that can be absorbed into our cells. Our body is made of digested food! A strong, steady (balanced) fire offers health and longevity. If our fire runs too hot or cold, our food will be burned or uncooked. This is where ama comes in. Ama is uncooked food, or food that we can’t process. The qualities of agni are hot, dry and light. The qualities of ama are cold, oily and heavy. The qualities of ice cream are cold, oily and heavy. Therefore eating ice cream reduces the digestive fire because it’s qualities are the opposite. First, anybody with kapha imbalance or too much ama should avoid eating ice cream as much as possible. Kapha imbalance will look like congestion, coughing, mucous, and weight gain. High ama will look like constipation, bloating, gurling in the stomch, prickling pain, sour belching, strong acidic smell, burning pain in chest or throat, cloudy white phlegm, sticky mucous and bad breath. No ice cream for now. Ice cream is cold, so it will increase both vata and kapha. Cold looks like poor circulation, muscle spasm, constriction, tightness, pain, cough, congestion, sinus problems, colds and asthma. No ice cream, but just for now. Pitta can be fiery hot, so a little ice cream isn’t so bad. Summer is the season for pitta, so for all doshas, if you want to have a little taste, summer is your best bet as you should have some good fire to counter it. Ice cream is sweet flavor, which is for nourishment. If you are already feeling really nourished, avoid ice cream if you want to loose a little weight. That being said, ideally, ice cream is nourishing for anyone feeling depleted, which is probably vata. Vata time of life is 50-70+, so seniors, you may have some ice cream! Let’s get back to cooking…not on the stove top, but in our belly. Since we know ice cream contains the opposite qualities of agni (our digestive fire) and will reduce it a bit, let’s look at when our agni is highest. That would be lunch time. 10am-2pm is pitta time of day. That could be a good time to have some ice cream since the agni is being fueled by the sun. But…that is lunch time! So unless you plan on just having ice cream for lunch (this is sounding delicious!) let’s have ice cream when you don’t have a full belly of food. Maybe consider having a little ice cream treat alone, instead of as a dessert right after a meal. This could be around 3pm, after letting your lunch have all of the digestive power. Vata time isn’t a time of high fire, but it’s still better than kapha time (6pm – 10pm) which is the worst time of day to have it. Definitely avoid ice cream after dinner. Feeling like there has to be a loophole to all of this? Yes…let’s look at that! There are spices that increase agni and help to digest things like ice cream, and even burn out ama…which is most likely what your ice cream will turn into. To stoke the fire, have a ginger appetizer 15 minutes prior to eating this little scoop of ecstasy. Cut a small piece of fresh ginger, squeeze a little fresh lime juice over it until the ginger is half covered in the spoon, and sprinkle rock salt on top of that. Now you’re ready to go! Another awesome loophole is spicing up your ice cream! You can add a little cinnamon, but the best spice is cardamom. It will balance the sweetness and coldness. If you don’t want to kill the flavor of the ice cream, just chew on some cardamom seeds after eating it. Spit ’em out after chewing them awhile and rinse the pieces out with water. I, like all of you, love ice cream. We are almost in the heart of summer, so enjoy a little ice cream. Ayurveda isn’t about a set of rigid rules, it’s about choices and consequences. Nobody ever died from ice cream and ayurveda is all about moderation. So go ahead and treat yourself once in awhile! Maria is an Ayurvedic Wellness Counselor and offers health consultations. If you want to learn about your dosha, how to strengthen your agni or how to burn ama, you can book an appointment. Instagram Feed – Add #mariyurveda to your home cooking posts to be displayed here!